1. How has OB technology and workflow evolved over the years? A big leap was the advent of digital transmission, particularly COFDM digital transmission that made non-line-of-sight possible. Small transmitters attached to a camera makes so much more sense from the operator's standpoint, rather than running cables. This allows crews to be smaller, and being untethered means better shots from more locations, so content improves. Today, even small crews are often expected to do everything, including editing stories from the field. Because of this, ease-of-use and reliablity have increased in importance. Time is limited to troubleshoot problems in the field, so a simple, lightweight wireless system for getting a story back to the OB van is required. 2. 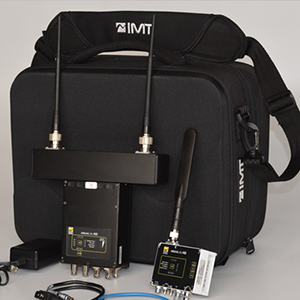 What are the "must-haves"' for wireless camera transmission? Customers continue to demand ever-increasing reliability and robustness, non-line-of-sight capabilities, extended transmission distance and the use of a non-proprietary core technology. Ease of set-up and use are also becoming increasingly important, particularly for wireless systems deployed in new markets, beyond broadcast stations. New markets, including the rapidly growing use of wireless in conjunction with UAVs and drones, require a reliable wireless link. 3. Why is COFDM the most reliable modulation? Unlike other modulation schemes, COFDM maximizes its parameters for uncompromised reliability. In the presence of interference, it does not fail like Wi-Fi or other technologies. The "C" in COFDM stands for additional coding, and thus additional reliability in multipath environments. This makes COFDM a much more dependable, robust modulation scheme. In real-world terms these features translate into superior non-line-of-sight performance in buildings, sports venues and urban environments. 4. What are the benefits of having a fully-equipped OB vehicle as part of the station's equipment? The bottom line remains the same: you have to get the story, whether it's interesting live shots from a county fair, breaking news like a fire or some other must-have content. While new technologies have emerged over the last few years that promise a lot, COFDM is the techology to rely on. While COFDM is a proven and reliable modulation, many stations combine various technologies to get the story. Mission-critical video, beyond just news, demands the reliability that only a COFDM system can provide. Specialty camera coverage has also become an expected part of the coverage of large sporting events. Forward-thinking production companies are increasingly using wireless systems to improve their content. Just last year, unprecedented coverage of the 115th U.S. Open Golf championship was captured for FOX Sports using a drone. This marked the first use of live HD footage from a UAV or drone for a sports telecast. Helivideo used IMT's microLite system on its drones to transmit aerial footage, after previous attempts to achieve UAV shots with other equipment were unsuccessful. Using a reliable COFDM wireless transmitter allowed the drone to fly at low altitudes, and hover behind sand dunes and sand traps while maintaining a solid signal. 5. What are the basic considerations that a station needs to know before looking to aquire/outfit an OB vehicle? Cost is always a consideration, including the initial cost of a new system. If a station chooses a bonded cellular or satellite system, there are also potential recurring monthly costs to consider as well. However, if they choose a COFDM system, there are no reocurring monthly costs. Ease of equipment use and rapid set up matter more and more as the engineering resources at a typical station are often dwindling in today's world. How the equipment will fit into existing station infrastruture is also an obvious starting point. 6. What are the tell-signs that a station should look to upgrade their OB vehicle? You might want to look at upgrading if you've not yet started sending in HD from the field, or if the HD system used is not MPEG-4 compatible. When using MPEG-4, a station can improve its HD video quality. Another benifit of MPEG-4 is that the station can reliably split their assigned channel into two seperate frequencies/signals, essentially creating two channels out of one. 7. Where do you see the future of OB technology heading, and have you seen any interesting applications of your technology lately? Primary news events will continue to rely on multiple technologies to backhaul the news: satellite, terrestial, and bonded cellular will coexist. This means no more cables tethering the camera to the backhaul infrastructure. We've recently seen several users relying on small, lightweight COFDM-based wireless camera transmitters to reliably cover the story and get it back to the ENG truck. Then, they use bonded cellular to send that content from the truck back to the station.